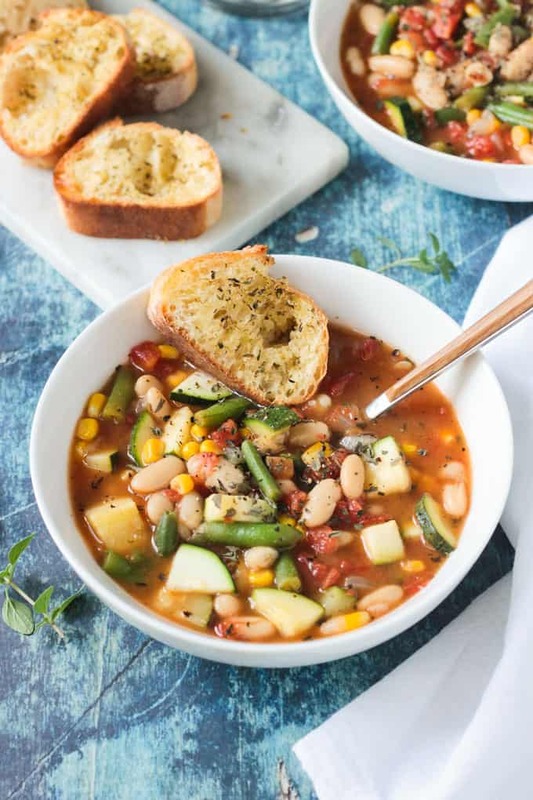 Summer Stew from Vegan Yack Attack On The Go – an easy vegetable and white bean soup recipe that uses the best of summer garden offerings. It all comes together in less than 30 minutes! 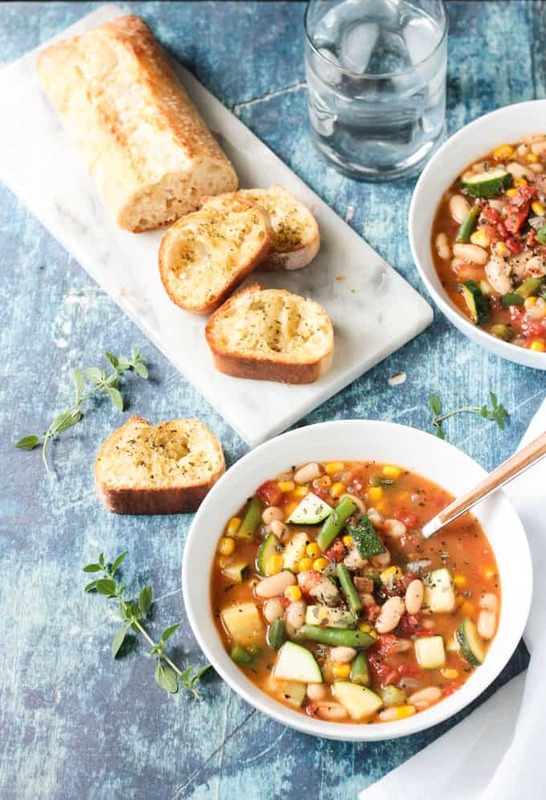 Hearty and comforting, yet light and nutrient-packed, this Summer White Bean Soup recipe can be on your table in less than 30 minutes! 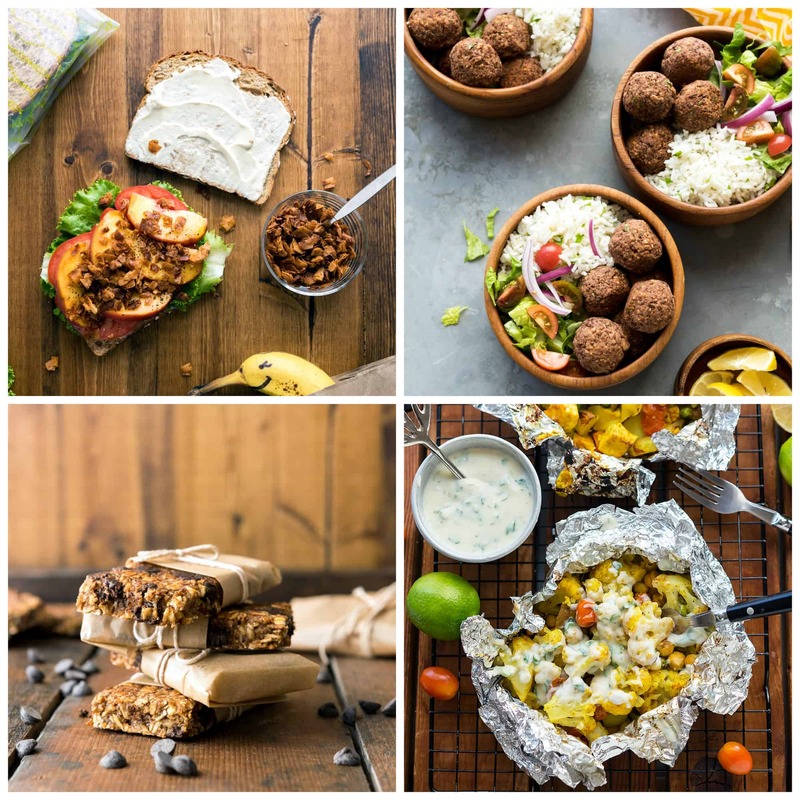 It’s just one of 100+ recipes you’ll find in Jackie Sobon’s new cookbook, Vegan Yack Attack On The Go. Keep reading for a full review of the cookbook and the recipe for this delicious Summer Stew. Jackie is the creative genius behind the blog, Vegan Yack Attack. There you’ll find everything from breakfast to desserts, healthy to indulgent, and, of course, they’re all vegan. You might remember a couple of years ago when I shared this epic S’mores Pudding Bowl from Jackie’s first book, Vegan Bowl Attack. Don’t let summer pass you by without trying that one! Now, I’m thrilled to share with you, Jackie’s second book, Vegan Yack Attack On The Go! 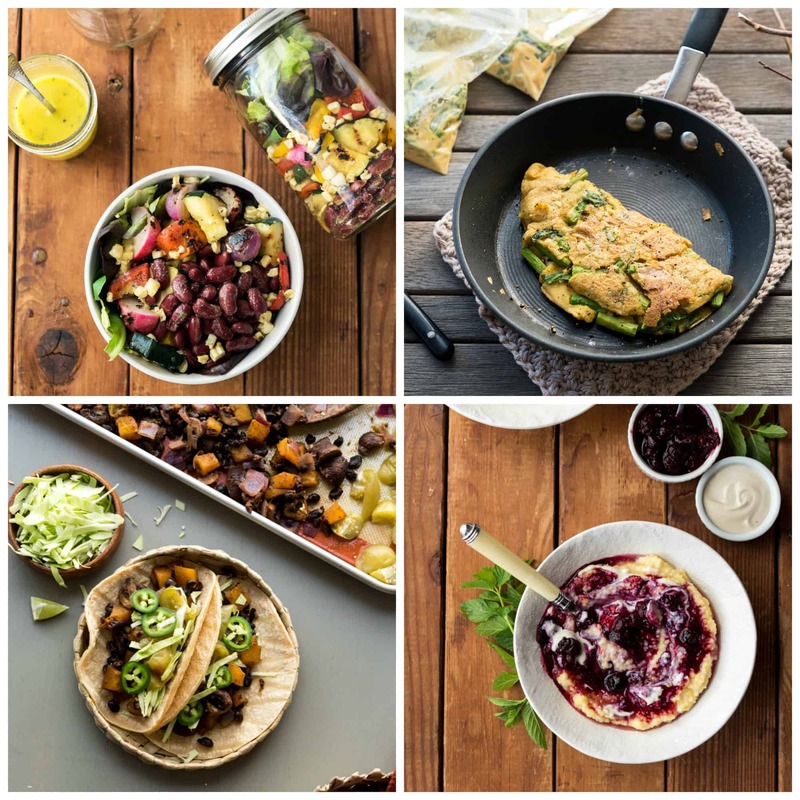 Each recipe is tagged with one or more of these helpful labels: Under 10 Ingredients; 30 Minutes or Less; Portable; Make-Ahead; One-Pan; Gluten-Free; Soy-Free; Nut-Free; Oil-Free; Sugar Free. Take the guesswork out of how to feed your busy family and get yourself this cookbook! Photography credit: Jackie Sobon. Vegan Yack Attack On The Go! © 2018 Quarto Publishing Group USA Inc.
Plus there is a chapter called Vegan Eating Made Easy that contains Pantry Necessities, Essential Kitchen Equipment, and Helpful Tips & Tricks. 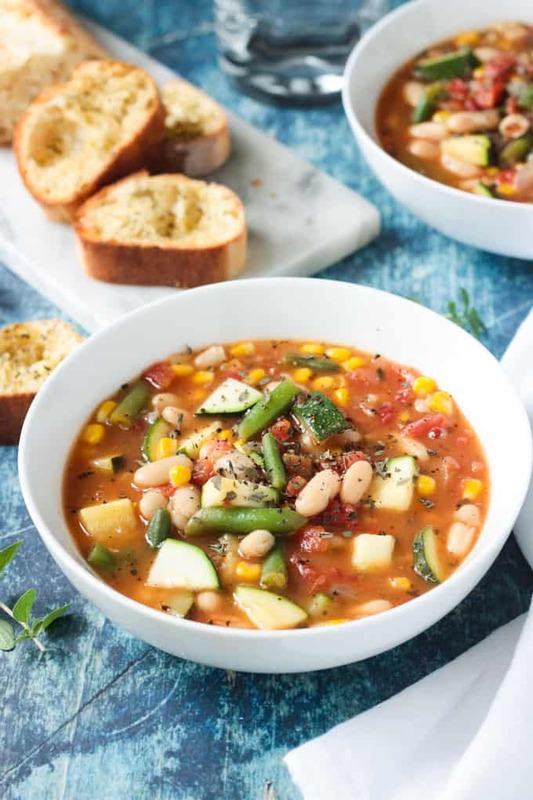 Take this cookbook on a trial run by making Jackie’s perfect vegetable and white bean soup recipe (Summer Stew pg. 99). It’s gluten free, soy free, nut free, and sugar free. It can be oil free, too, if you use a few tablespoons of broth instead of the 1 tablespoon of oil. It’s made all in one pot, can be made ahead, and takes less than 30 minutes. Perfect for an easy tasty lunch or a hearty dinner paired with a hunk of crusty bread. Easily packable in a thermos for school or office lunch boxes. I hope you love this Summer Stew as much as we do. If you try it, please come back and leave me a comment below with your feedback and star rating. 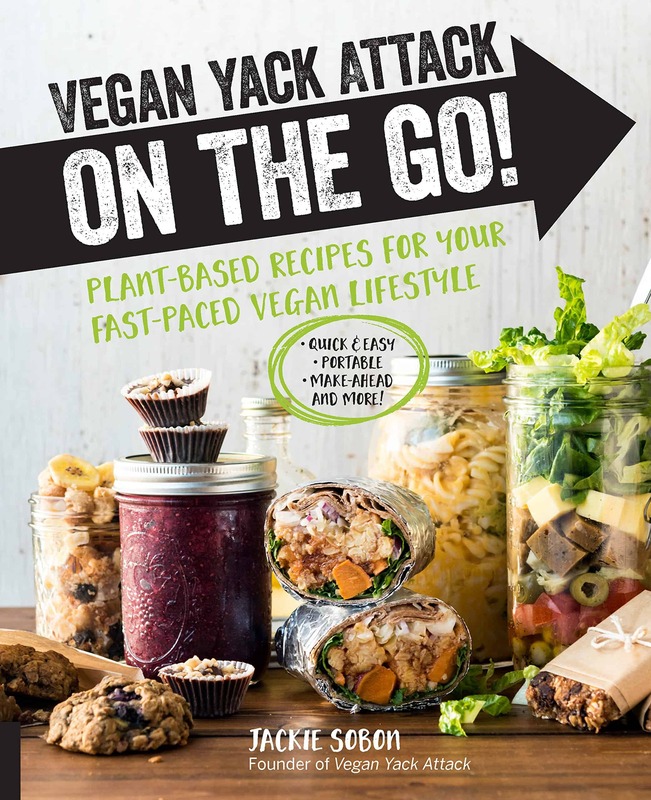 Don’t forget to order your copy of Vegan Yack Attack On The Go now! Even if you don’t have your own garden, you have probably known someone that was inundated with tomatoes and zucchini once summer came around. 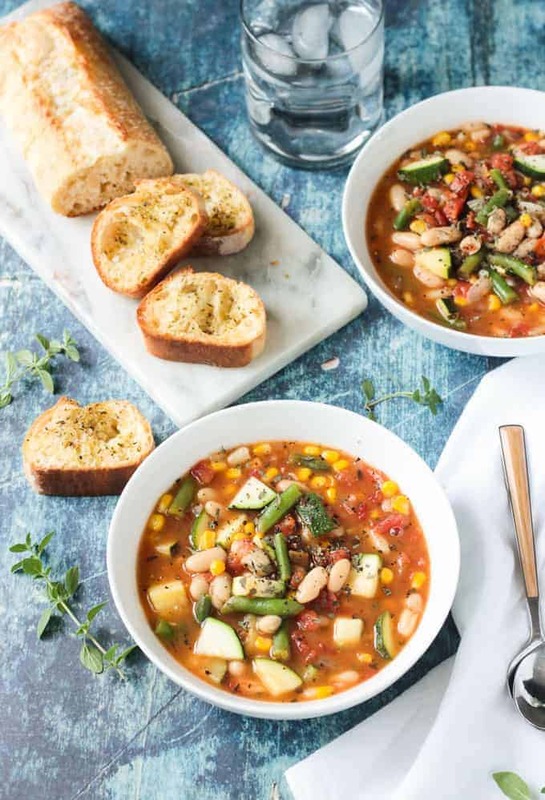 This stew uses much of the produce that summer has to offer, such as zucchini, green beans, tomatoes, and corn, and it does so quickly and deliciously! I love serving this with basket of toasted, crusty bread on the table. *Vegan Yack Attack On The Go! © 2018 Quarto Publishing Group USA Inc.
100 Cummings Center, Suite 265-D, Beverly, MA 01915, USA. Warm the oil in a large pot over medium heat. Once hot, add the onions, zucchini, and green beans to the pot, sautéing for 5 minutes or until the onions are mostly translucent. Next, stir the garlic, tomatoes, and corn into the vegetables, sautéing for 3 more minutes. Add the white beans plus liquid, vegetable broth, basil, parsley, black pepper, and optional red pepper to the pot. Simmer covered over medium-low heat for 7 minutes, stirring occasionally. Taste the stew and season with salt, plus more herbs if you prefer. Serve hot. ~Jackie says, "Tip: At certain grocery stores you can buy grilled corn in the freezer section. I love thawing this out and using it in recipes like this one to add even more flavor." « Easy Watermelon Juice – No Juicer Needed! I love this idea! 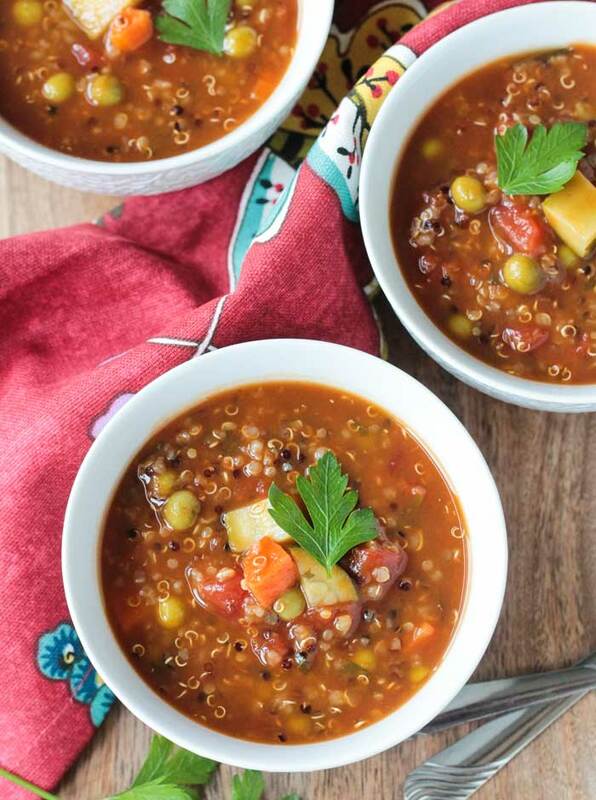 Summer veggies in a warm stew, can’t go wrong with this one! I agree. I think you’ll love it! Thanks, Jacque! 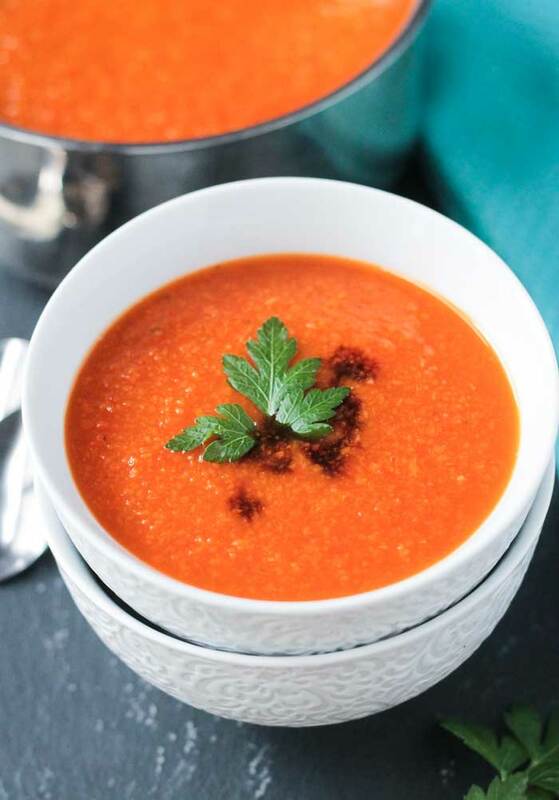 I never think to make soup in the summer but this looks perfect. 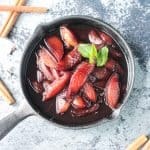 I actually have most of the ingredients so I think this would be so perfect for dinner tonight! I love soup all year round. Hope you love it, Stephanie! What a great book! I love eating vegan at least once a week!! 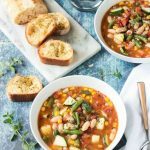 And as I love soup all year round, I will be trying this white bean soup very soon! I’m a soup-all-year-round girl, too! Hope you love this one! Thanks, Elaine! Yes, that sounds perfect! Thanks, Jessie! 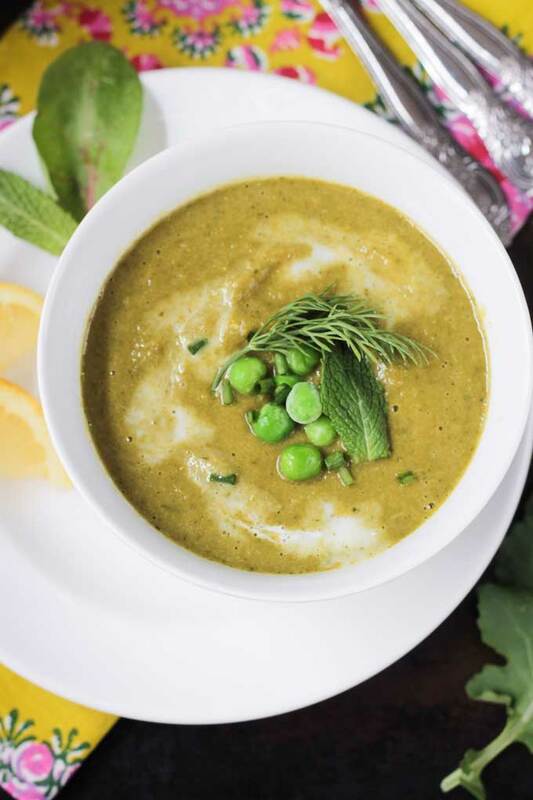 I love to make soups in the summer with all of the fresh veggies popping in our garden. Yours looks absolutely gorgeous! Just pinned…thanks for sharing your recipe! Thanks, Traci! Fresh garden vegetables are the BEST! That book is just so darn lovely! I’ve been flipping through my copy lately. I haven’t tried this soup yet, but have it earmarked! Soooo many recipes I can’t wait to try!